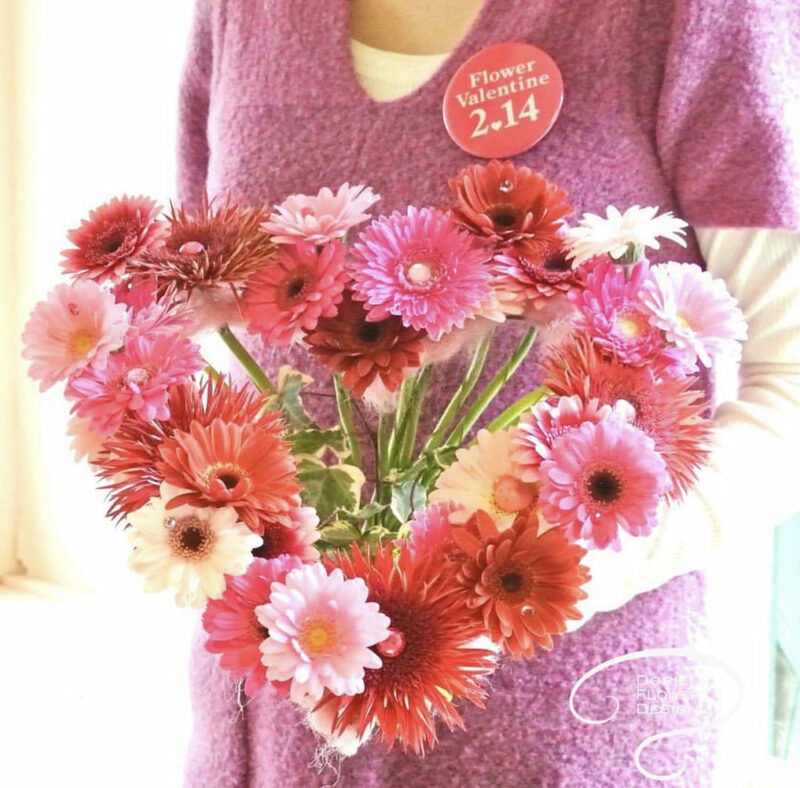 Sharing flower power ​and passion for flowers became ​my​​ lifetime work. The love for flowers I got from my grandfather. 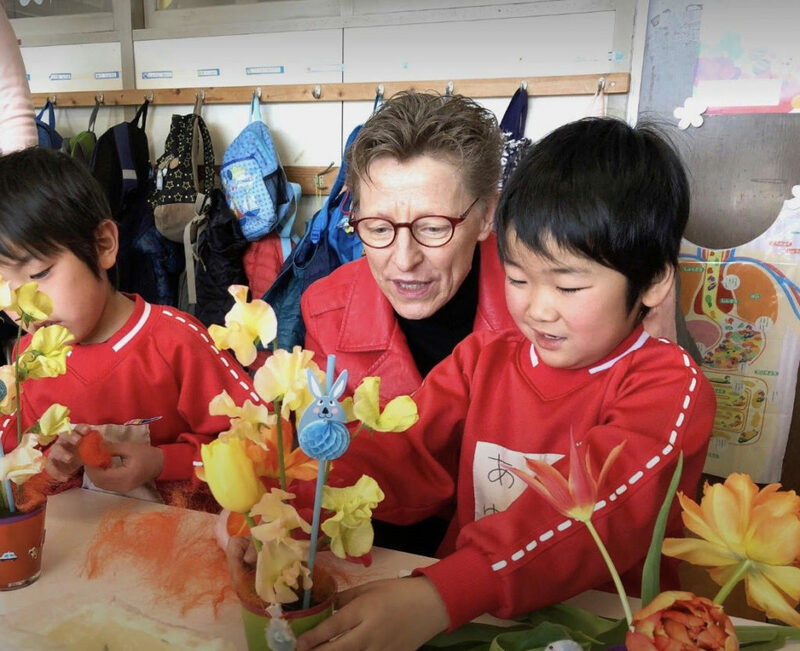 Knowing that flowers makes people​​ happy​ and warms their hearts,​ ​is my drive to continue teaching it gives me great satisfaction. Flowers for​ happy weddings​,​ flowers for grieve, flowers for new born babies​ for graduation, opening new business, birthday, wedding anniversary, valentines, mother’s day​. Flower tells I love you​, I care about you​. How great it is to receive flowers!!! Once I had to teach ​17 ​directors from hospitals all male- first time for them to make a flower arrangement. Being creative – using ​their​ sense , a great way to massage ​their​ brains creativity!! Later we heard that their wife’s where so surprised and happy with the hand made flower arrangements by their husband.​!! Time =Money inspired me to make a e-book about SPEED. #Speed in a flower examination; Can you make it in the time frame. #Speed in your demonstration; making a hand tied bouquet in no time always give your students/ audiences a “WHOOOO” moment !!! You are the expertise and have to show that!! I made a e-book about my SPEEDY points that I use every day. hope this tips will help you to speed up!! Of course practice every day is the main key point for our SPEED. 1)Please let me know which tips you liked most? 2) Do you have other SPEED UP tips? Please let me know!! Let’s keep sharing the flower power to make our heart warm and  happy. She LOVES flowers and that is easy to arrange for me. My florist friend make a flower bouquet with my mothers favorite flowers. She deliver them, and instead of the message card I make a video message. So my mother get fresh flowers and a short video. What a great way to make her happy​​! Flower power makes people happy. 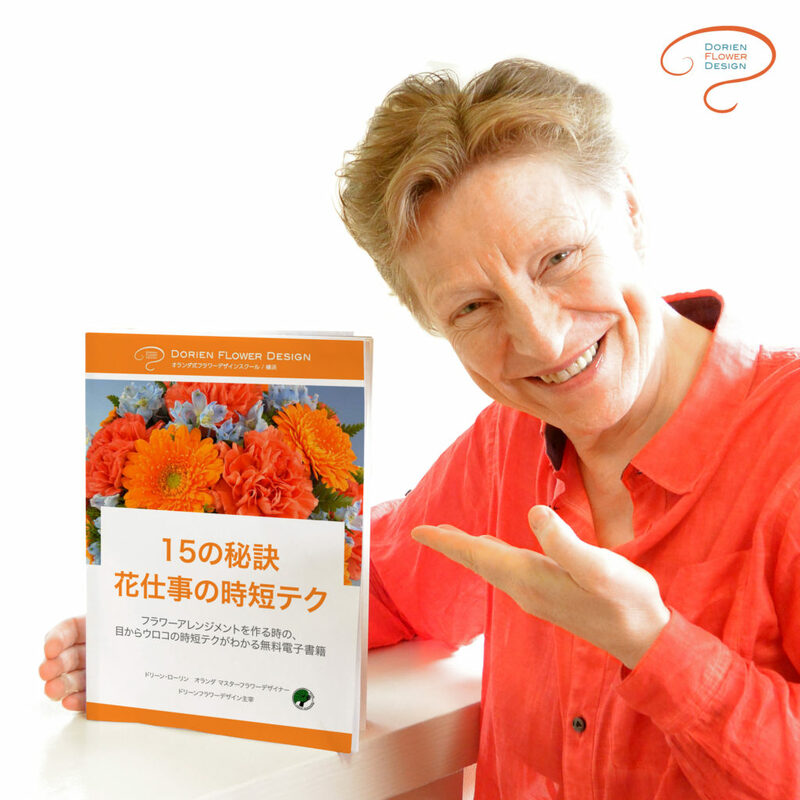 Do you like to study Dutch Flower Arrangement? Last call for our OPEN LESSON day 16 June. 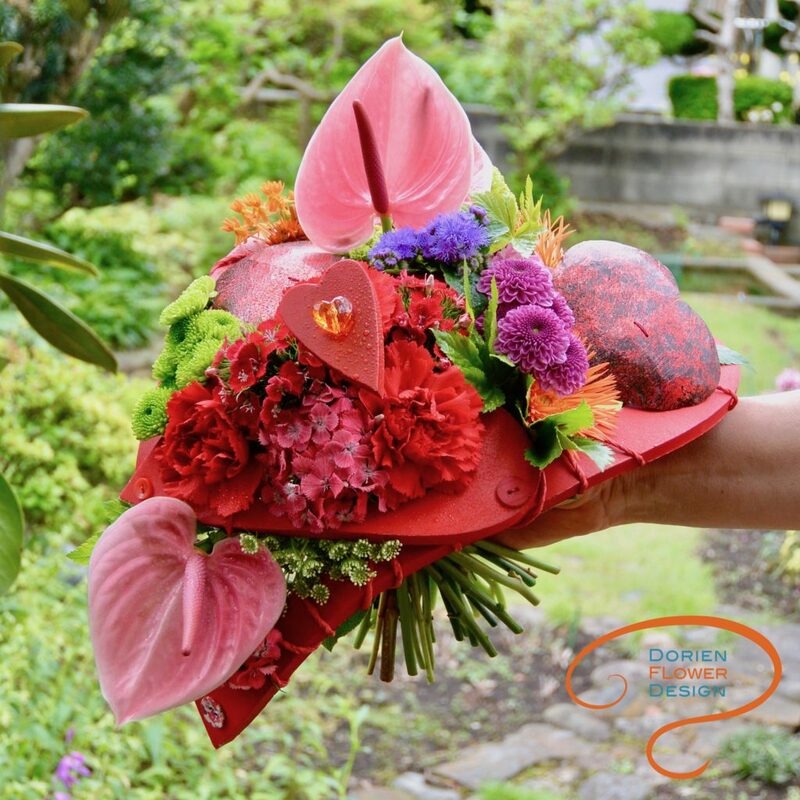 In the morning I will show you what kind of beautiful flower design you are going to master, and in the afternoon you will make a hand tied bouquet . Welcome to join !! what is you favorite transportation on you wedding day? For me to use Horse with carriage on my wedding day is most romantic. 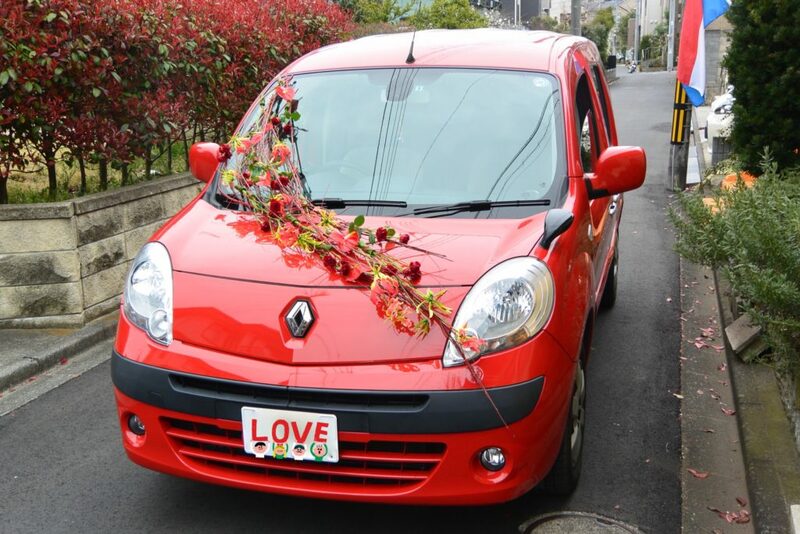 Being picked up from my house (I can hear the click clack from the horse shoes :):):):)drive to the town hall decorated with beautiful flower arrangement to marry and then take a nice tour with the  carriage in nature to make some great photos. Can you imagine the carriage decorated with beautiful fresh flowers!!! This is for me no 1. Their are also other options: antique car or your own car, motorcycles, bicycle or ‍♀️ boat. All unique transportation options in the Netherlands  for the wedding day. And all decorated with fresh  !!!! Which one you like to use on your wedding day? Please let me know. Students make this modern car  decoration in the ADFA Advance Dutch Flower arrangement lesson. Relax, smile and enjoy the flower power!! Are you sharing the FLOWER POWER? When I was 12 years old my teacher asked me ; What is your biggest dream Dorien? Now 45 years later this is still my biggest dream to make people happy and smiling with FLOWERS. Unbelievable experience for me was with the Warm Heart Project for the Children in Tohoku after the earth quick 2011. FLOWER POWER did made the CHILDREN SMILE even after this tragedy. This children showed me the power of the flowers, the warm heart and the beautiful smiles. I am so grateful to be a flower designer, through the flowers we can touch peoples hearts. Take one step today to realize your dream!! Please let me know your dream !! Your time is the most precious item in your life. If you learn HOW to SPEED UP your working time you will have less stress and even have time to drink a cup of coffee between making flower arrangements. Time is money, time frames limits are set all over in our flower business. Students using this SPEED UP technique for their flower arrangement examination. And all our students passed their examination last February 2018. For our Dutch Flower Arrangement examination SPEED is a big factor of passing the examination. 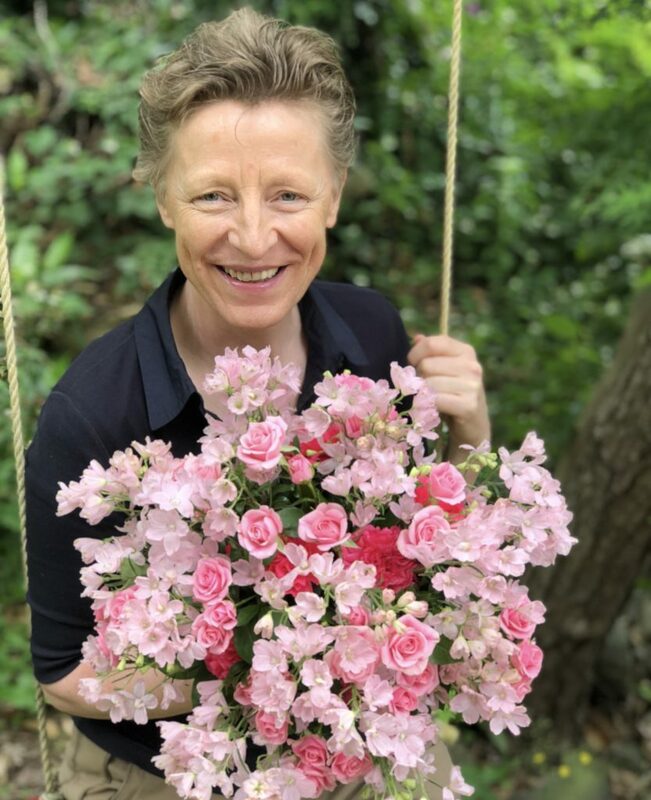 With this diploma you are a Dutch Flower Arranger and capable of working in a (Dutch) flower shop – and then you can make arrangements in a SPEEDY way. I am making a E-BOOK with 15 TIPS How to SPEED UP Your Working Time. 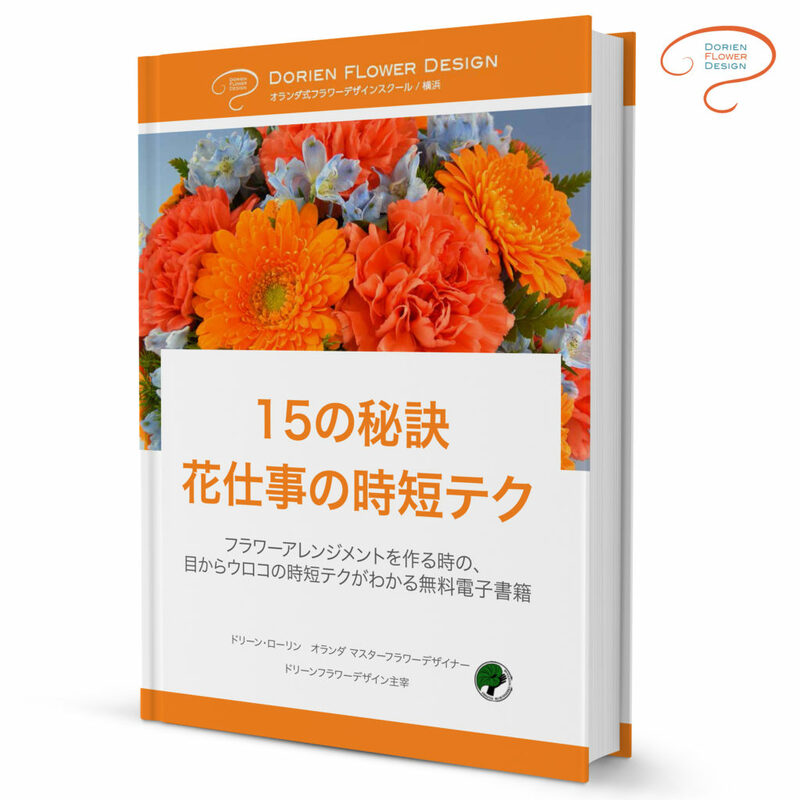 This E-Book will give you the biggest eye opener ever on how to SPEED UP your Flower Arrangement. The E-Book what will come out SOON will be in Japanese and English. We will keep you informed when this FREE E-Book is available to download. Relax Smile and Enjoy the Flower Power. His camera is coming so very close to my arrangement!! 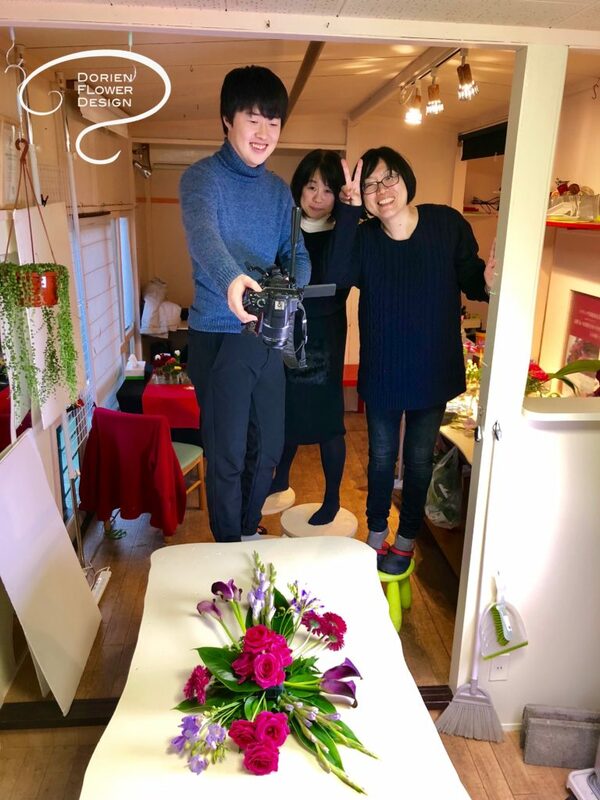 Last Saturday 31 March we took the last 2 arrangements videos 🙂 🙂 :)now Shimizu san is working with full power on editing and I am writing the text documents. This will be in English and Japanese. I hope this videos will help you to make beautiful DFA arrangement by your self. I will ad a self check list so that you can evaluate your own arrangement. You cant wait to see it I know >FROM 1 OCTOBER 2018 it will be ON-LINE. Taking step by step photos of flower arrangement for my books is something total different then taking video!!!! The video camera man has to do booth and taking video from all angles ..(his camera is coming so so so very very VERY close to me and my arrangement….) and he has to take step by step photos for the text documents. I am very impressed by the skills of my just graduated fresh video camera man and director. 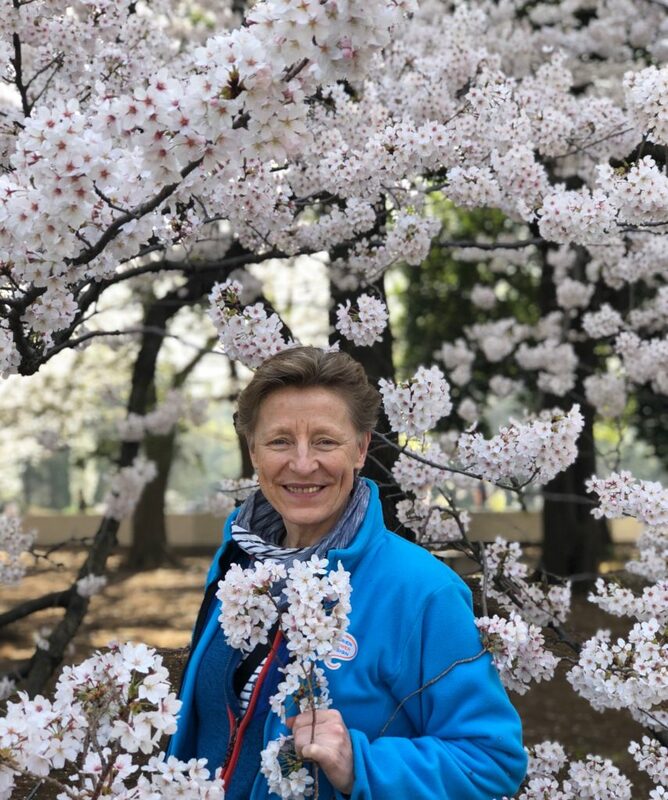 This very exciting video project needs a great team spirit Hata Atsuko sensei EFDA DFA INSTRUCTOR was the director of the video project and closely watch each video shot from Tsuchiya Shodo kun – what is important and where to focus. Standing up 4;00 am buying flowers at the flower auction market in Tokyo, driving to the atelier and put all the flowers in water with Chrysal. 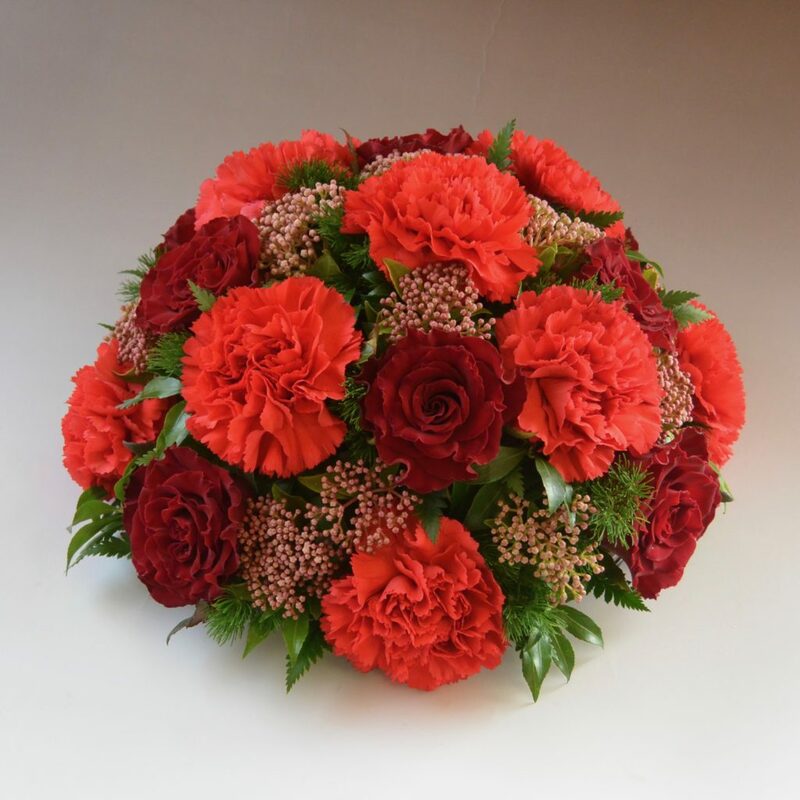 We love to take care of top quality flowers and make top quality DFA arrangement. All the arrangement are exact as in the matrix of the international DFA examination, ready to put in the examination room be judged.  and get 10 points!!?? We have a great job working with FRESH FLOWERS. I am feeling blessed to be able to work with my great video crew. As you can not wait to see the first video I can not wait to hear your comments!!! Will be continued. Whooo Whooo Whooo Japan is HEAVEN now with all the FULLY BLOOMING PINK SAKURA trees !!! And the temperature is so NICE with 25 degree, the energy and the fragrance whooo whooo whooo, this feels like HEAVEN!!! All the kids are playing in the park and having BBQ, I could see many people making beautiful paintings of the pink Sakura trees. Everybody looks so happy and that makes me HAPPY TOO. p.s. Dorien Trendy workshops till summer are fully booked only one seat is still available, April 15 Sunday from 10;00 to 17;00. You are going to make a trendy frame bouquet with Fresh flower in a special circle technique and in the afternoon a two in one design with 2 Dutch Trendy vases on one plate. Lets enjoy and creating the flower powered designs & eating a fabulous home made luncheon in the atelier garden. Max 8 students. Shall we meet on 15 April? One seat left first come first served; call for reservation . ​ 090-4028-1427 Dorien or 090-1660-4899 Hata. Enjoy the SAKURA PETALS DANCE.